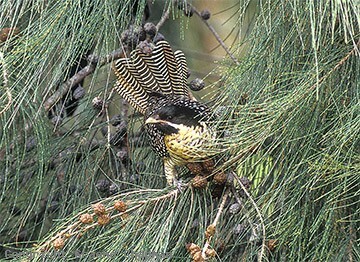 In coastal eastern Australia in Spring when all the migrant birds return from their wintering grounds further north, no arrival is more obvious than that of the Eastern Koel. The loud repeated coo-weee calls of the males as they re-establish their territories and try to attract a mate almost compete with the kookaburras to see how early they can wake you up. About a week after the males start calling, the females can be heard answering with their strident "keek keek keek keek," fortunately not at daybreak but usually later in the day. Males also have another raucous call, a loud "wurra wurra wurra" with which, when they sing together with a female can sometimes sound like an antiphonal duet but in most cases they are not well-synchronised and it simply sounds like a cacophany. Koels are actually true cuckoos and lay their eggs in the nests of other birds, notably friarbirds, wattlebirds, figbirds and magpie-larks but the list of known hosts is long. The female koel lays a single egg directly in the host's nest but she may subsequently lay in a number of different nests in a season. Male koels may have more than one female in a season, but not at the same time so this has been termed "a form of monogamy". Eastern Koels have a range of displays which are rarely observed but described well in HANZAB. (Handbook of Australian New Zealand and Antarctic Birds) Aggressive encounters may involve spreading of wings and tail and courtship displays involve a lot of bowing. Male Koels have also been seen offering food to their mates - known as courtship feeding. The male in pic #347205 and female #347204 had just been down in our vegetable garden at Jervis Bay in NSW. I saw him offer her a cherry tomato, much like the one in Pic# 347206D. 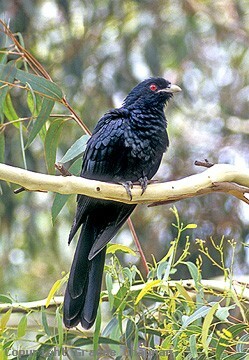 When we lived near Mt Coochin in the Glasshouse Mountains of southern Queensland, a male Eastern Koel had centred his territory in a group of huge mango trees near our house - whether it was the same male year after year is not easy to prove but the territory was occupied for at least 10 years. 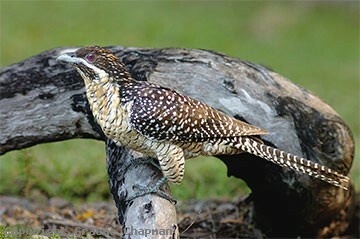 I know of another instance near Brisbane where a banded individual returns to the same place year after year. 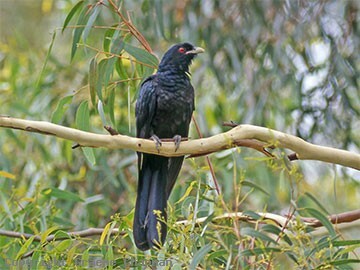 There are two subspecies of Eastern Koel known in Australia - one occurs down the east coast about as far south as Mallacoota and very occasionally elsewhere in Victoria and the other in tropical Australia roughly north of 20 degrees latitude. Most koels leave Australia for the winter but which ones go where is not clear. There are many subspecies throughout New Guinea, the western Pacific and even as far afield as India. The most notable known long-distance movement was of a bird banded at Lane Cove, NSW which travelled to Old Iare Village, Gulf Province PNG, a distance of 2950 km. 347203 ... Eastern Koel, adult male. 347204 ... Eastern Koel, adult female, dark form.